Are you interested in the answers to some of the most common questions that readers ask about dress codes? 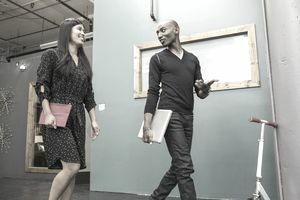 Dress codes and recommended business attire are popular topics because employers wonder what they can require – legally and ethically - while caring about the comfort and morale of their employees. The sticking point for many employers is the implementation of the dress code. If you used a cross-functional team that sought input from across the organization, to create the dress code, you are on the right track. The more you involved employees in writing the dress code, the more widespread the ownership will be when it is announced. Why do you need a dress code at all? If your answer is because you have a small number of employees who do not dress appropriately in business attire for work, this is the wrong reason for a dress code. Deal with inappropriate business attire on a case by case basis. If you have a widespread disagreement about business attire, the guidelines provided by a dress code can help you offer direction for all employees. If something has changed in your work environment, you may also need to develop a dress code. For example, a change in the dress code makes sense when a company that consults with clients who come to the office, shifts its focus to product development for customers online. How detailed do you need the dress code to be and why? You will need to explain the rationale behind every contentious requirement to employees. Do you have multiple employee groups who have different contact with customers and clients? You may need more than one dress code. Because of all of the possible ways in which the introduction of a dress code can go wrong, David Monks, JD, a partner in the San Diego office of Fisher & Phillips LLP agreed to an interview. Monks specializes in employment law. Susan Heathfield: Are there limits to what an employer can put in a dress code? David Monks: Not really. An employer has much latitude in deciding what its employees will wear or cannot wear. But the employer cannot apply the code in a discriminatory manner or refuse to accommodate an employee’s legitimate needs based on religion or medical condition. As an example, an employer cannot treat employees less favorably because of their national origin, such as by prohibiting certain forms of ethnic dress. In addition, a rule cannot unequally burden one gender over the other. An employer can have different rules for different kinds of employees. For example, while receptionists, customer service representatives, and other kinds of employees who interact with customers and clients can be required to dress professionally, back of the house workers might be allowed to dress more casually in jeans and rubber-soled shoes. Heathfield: This is one of the most frequent questions received from readers. How can managers consistently enforce the dress code? Monks: The most important factor here is training. An employer must ensure its managers know and understand the dress code, including the employer’s rationale for various rules. Then managers must diligently enforce the dress code on a consistent basis for all employees. They must be neutral, in the sense that they cannot favor one employee over another. If the managers buy into the dress code and take the time to educate their employees about the reasons for the rules, the managers will be in a better position to more evenly enforce the policy. Heathfield: When working as an HR Director, our employment law attorney repeatedly told me that the punishment must fit the crime. What punishment fits the crime if an employee ignores the dress code? Monks: With nonexempt employees, for the first offense, an employer typically reprimands the employee (verbally). Depending on the circumstances, the employer might also send the employee home to dress properly and return to work. During his or her absence from work, the employer would not pay the employee. A second or third offense might come with a written reprimand. Suspension without pay might be an option for persistent offenders. An employee who repeatedly violates the dress code may end up being fired for it. Heathfield: How would an employer handle an exempt employee in similar circumstances? Monks: Good question. Typically, you cannot deduct pay from an exempt employee's wages or vacation/PTO bank, except for certain kinds of absences, and then only when the absence is at least half a day (four hours). It's unlikely that an exempt employee who is sent home for a dress code violation would be gone from the office for four hours. But the disciplinary course of action recommended is the same. Heathfield: Other than potential sexual harassment, is there any other legal issue that an employer needs to be aware of? Monks: Yes. An employer must reasonably accommodate bona fide religious needs unless doing so would cause undue hardship. An employee with legitimate religious beliefs may ask to be allowed to wear certain jewelry or piercings, or a headdress or similar garment, even though the wearing of such items are in conflict with the dress code. Similarly, an employee’s disability or other medical condition might require an employer to relax the dress code standards for that employee, depending on the circumstances. One example is an employee whose foot problems require her to wear sneakers for a period of time, instead of something more formal required by the dress code. Implementing a dress code can be trickier than it first appears. Heed the advice offered here to make your dress code implementation successful, legal, and respectful of employees. These are all of your options for various dress code policies and a Sample Policy Receipt Acknowledgement Form for your training sessions. Here's what to do if you need to reestablish a failed dress code policy. Susan Heathfield makes every effort to offer accurate, common-sense, ethical Human Resources management, employer, and workplace advice both on this website, and linked to from this website, but she is not an attorney, and the content on the site, while authoritative, is not guaranteed for accuracy and legality, and is not to be construed as legal advice, even when the interviewee is an attorney.